Amazon.com description: Product Description: This book contains the invited and contributed lectures presented at a meeting organised in the context of the XVIII general assembly ofthe IAU, held in Patras, August 19, 1982. Roughly one hundred scientists attended this meeting, the discussions were livel- sometimes heated - and the original time span allocated to the meeting was as a result, comfortably exceeded by about 50 % . The aim of this meeting was to determine the role of galactic gamma-ray astronomy within the general concept of galactic astrophysics. The timing, at the end of the COS-B mission, was regarded as opportune, because it gives interested astrophysicists the possibility for interdisciplinary studies using the existing gamma-ray data base (e.g. comparison with infrared, radio, X-ray, etc. astronomies), as well as for theoretical studies. The next generation of gamma-ray detectors will probably not be in operation for another 5 to 10 years, and therefore it is hoped that the proceeding of this meeting can be used (in the intermediate time) as a basis for further studies, as a stimulation for more theoretical work and as an important contribution for defining the aims and operation of future gamma-ray missions. The interrelationship with other branches of astronomy, the astrophysical implications and the study of relevant physical processes using available measurements in the near-Earth environment were important results of the meeting. Many persons contributed to the success of the meeting, in particular all those who either presented a contribution and/or took part in the discussions. 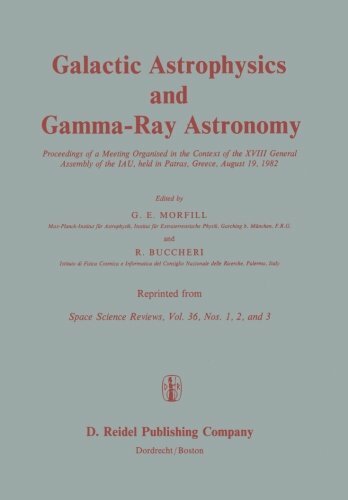 About: This book contains the invited and contributed lectures presented at a meeting organised in the context of the XVIII general assembly ofthe IAU, held in Patras, August 19, 1982.